This Easter, save money and have fun making your own homemade Easter gifts. You’ll find a variety of recipes on the site – and here’s a selection of quick and easy Easter gift recipes to make at home. If you want to give some homemade gifts – but you don’t have hours to spend in the kitchen – then here are some ideas. Homemade Easter Eggs: Making your own Easter eggs is easier than you might think! You can buy moulds in cookery stores – use a brush to paint on a layer of melted chocolate, dry, and repeat for a nice, thick shell. Get creative and squiggle the moulds with white chocolate before painting on the chocolate shell. Making Easter Chocolate Slabs: Have you seen the giant chocolate slabs that you can buy on the high street now? It’s easy to make your own, and great fun for children. Line a deep baking tray with clingfilm and pour in melted chocolate to make a thick slab. Then give the children a free hand with writing icing and sprinkles, to make customised chocolate slabs that friends and relatives will love! Floral Cupcakes: If you’re a cupcake baker, Easter is a time for edible flowers: violets, roses, rosemary and violas are all perfect for crystallising. Drop a splash of rosewater into the cake batter, then decorate with sugared flowers for a pretty Easter gift-box. These eggs are made in stages over several days, so they’re not a quick bake – but they make adorable Easter gifts. 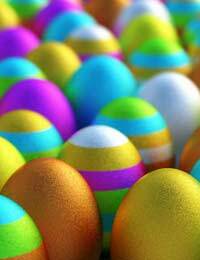 Package several painted eggs with cellophane and ribbon, or arrange in a basket of shredded tissue. Food colouring and small brushes. Tip the ground almonds into a food processor and add one cup of the sugar; pulse until you have a fine powder. Add the remaining sugar and pulse again. In a large bowl, whisk the egg whites just until they are frothy and a bit lighter. Add the vanilla and a pinch of salt. Now stir in the almond powder, a little at a time, until it’s all in. Knead the dough to a firm, pliable mixture. Either use it immediately or wrap it tightly in foil and keep it in an airtight tin until ready to decorate. Marzipan fruits are traditional, and of course you could use this marzipan recipe to make miniature oranges, bananas and apples to put on a Simnel cake. But at Easter it’s fun (not to mention easier) to make Easter eggs! Decorating the eggs is up to you. You can quarter the marzipan and knead in a few drops of food colouring to each quarter. Then pinch off pieces of marzipan and shape them into eggs by rolling them in your hands. Put the eggs on greaseproof paper and add extra colour using a paintbrush, then leave to dry for one or two days before adding details. You can also dip your marzipan eggs in melted chocolate, or push dried fruit or chocolate chips into the centres. The options are endless – use your imagination and have fun!